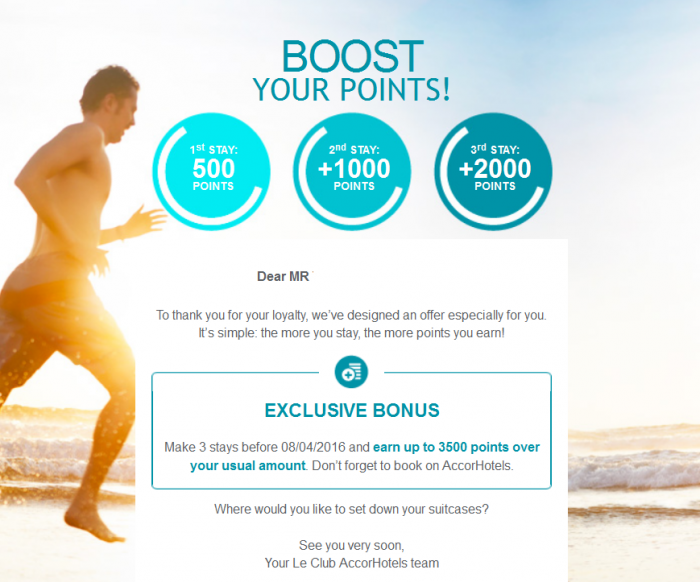 Le Club AccorHotels has emailed out new targeted offers for bonus points that a reader forwarded to me (remember to email me offers that you receive from programs). You could earn 500 points for the first stay, 1,000 for the second one and 2,000 for the third one by April 8, 2016. There is no registration link on the email but the email link resolves to Accor’s page here. This is a second time that Le Club AccorHotels has sent out targeted offers for its membership. Programs tend to send promotions such as this to accounts that have not had activity for a while trying to get them reactivated.